Except it’s about a foot long and there are 35 staples and it’s on his backside… it’s going to be a gnarly scar. The surgery took about three hours and we spent just one night in the hospital. They would have had us stay another night but Andy campaigned against it using the well-known tactic that we all learn as children: ask every single person you see, ignore every single “no” and focus on the one “yes”. So finally, because of Andy’s persistence, his speed of recovery thus far and the fact that we live a mere 5 minutes from the hospital, we were cleared to go home albeit not before the doctor made us promise to return if any of the following happened: bleeding from the eyes, vomiting blood, broken limbs, fainting, etc. None of these horrific things were expected to happen, but if they did, we were encouraged to come back. Needless to say, we agreed. 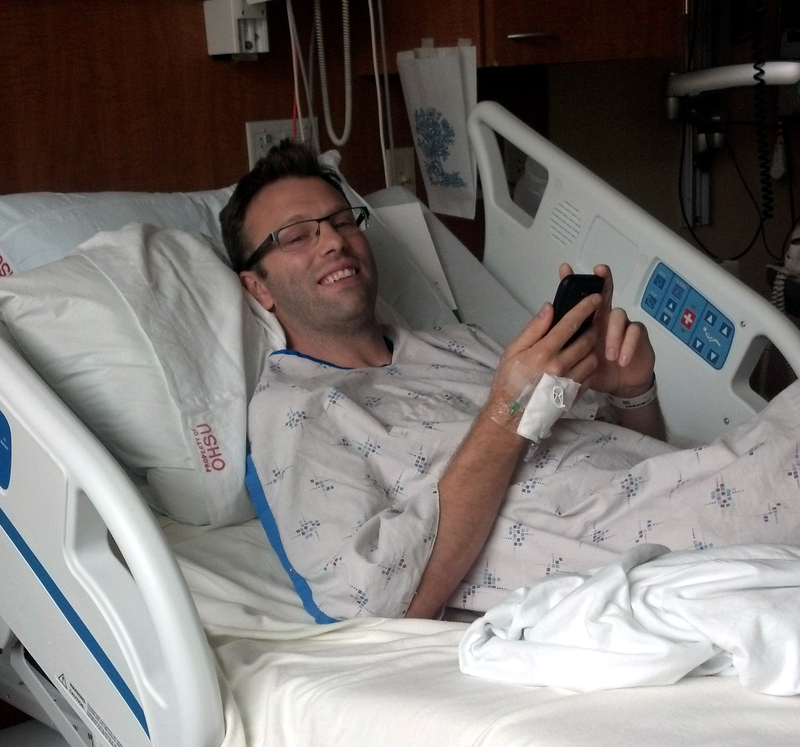 Medical gobbledygook: His sciatic nerve was flattened from the tumor, but otherwise intact and no damage was done. 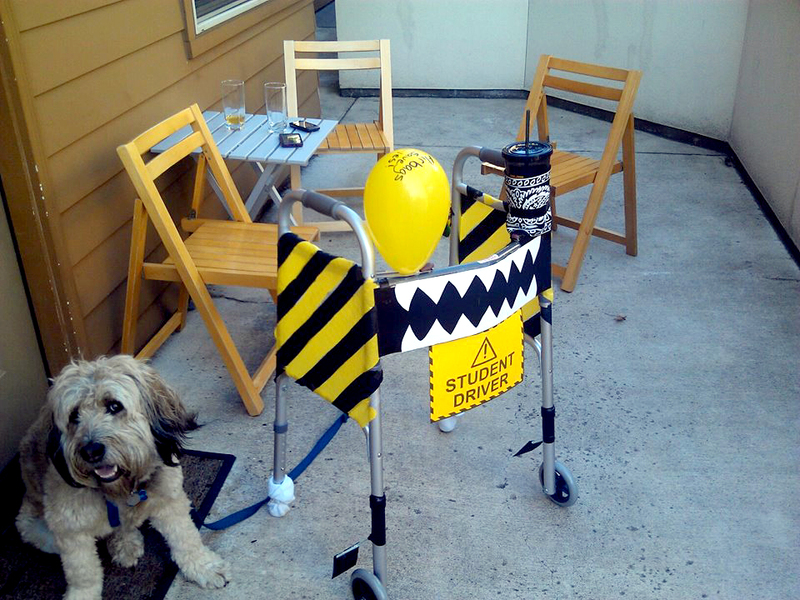 Layman terms: He can still walk! Medical gobbledygook: The pathology results showed that the tumor was an atypical lipoma enclosed in a fibrous capsule. Layman terms: The whole thing is considered to be just barely cancer and in a room full of specialists, debate might ensue if it should even be considered cancer at all. Bad news for people trying to write textbook definitions for medical dictionaries; excellent news for us. Medical gobbledygook: No chemotherapy is needed, no radiation is needed, no further surgery is needed. We went in for a post-op appointment yesterday and not only did the nurses love the modifications we did to Andy’s walker but they also loved how smoothly and rapidly his recovery is progressing. Okay, I’ll be honest, we did tone down the decorations a bit before going to the appointment – but here is how it looked right after our arts-and-crafts time. 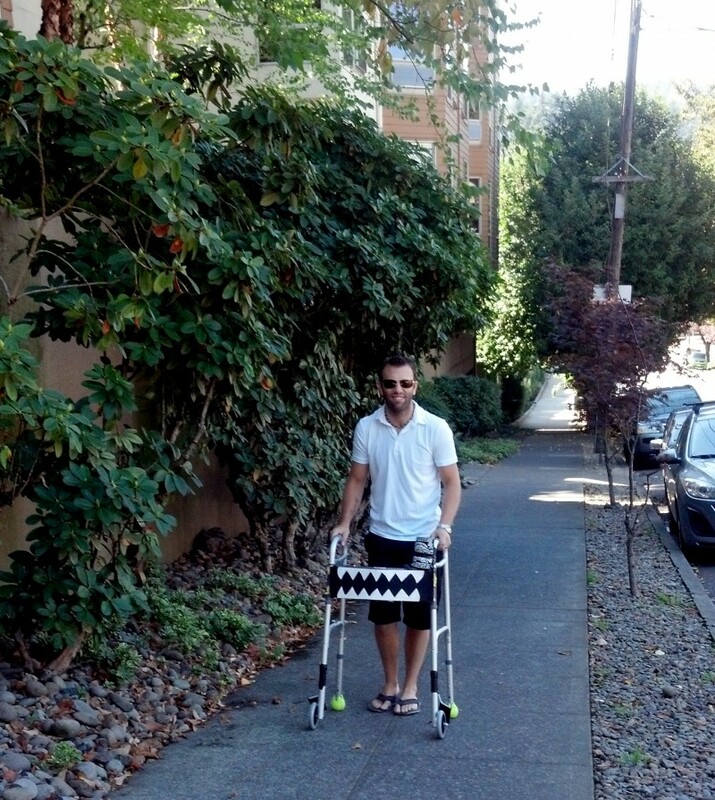 Here is how he (and his walker) looked yesterday on our way to lunch after his appointment. You gotta love a man who can make a walker look that good. 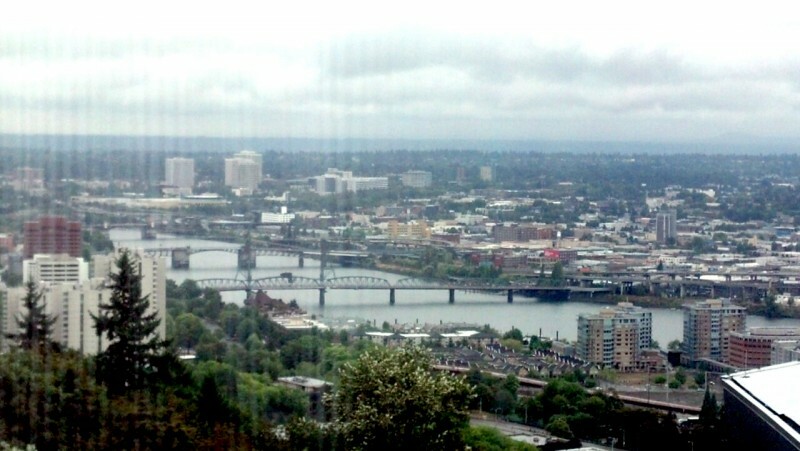 OHSU is amazing: personable and competent staff, hourly progress updates during his surgery from the operating room, great views – they really have it all. The view is really more impressive than this. This was taken with my cell phone on a cloudy day through a window. The pretty view was a nice reprieve but I had more pressing things on my mind than getting a good shot. My husband is amazing: even in tough times he still cracks jokes, still cares about everyone around him and throughout this whole thing has maintained an almost impossibly positive outlook. Last month, while sitting at a restaurant in Bogotá, he turned to me and asked, “If I lose the use of my leg, what should I go back to school for? I could get to pick a whole new career.” That man never ceases to amaze me. My family is amazing: they took care of our dog, ran errands for us and sat with me in the waiting room (and brought coloring books and crayons to keep me mindlessly occupied). 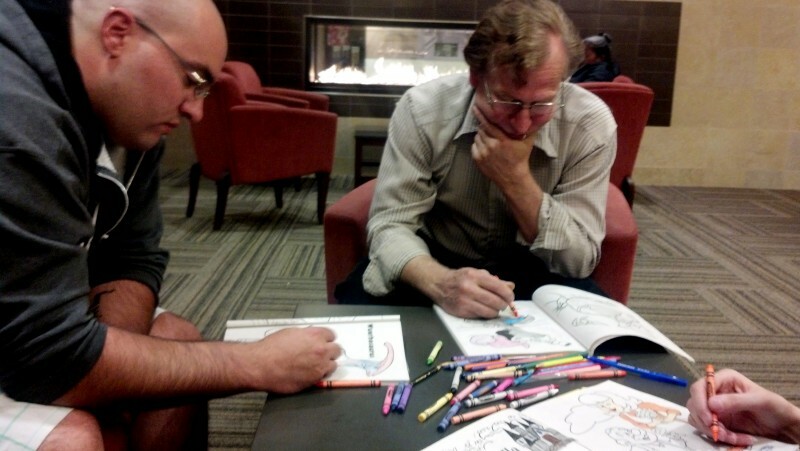 My father-in-law and our friend Chris keeping busy in the waiting room during surgery. Our friends are amazing: we got visits, we got gifts, we got food. Also, I can’t even begin to tell you how much the love meant to us that we got via text and online. So yeah. We’re pretty happy here at the Shamblin household. So happy in fact that I feel a little guilty. Yesterday, at our appointment, the doctor was late to see us. He was running late because the conversation with his last patient had run long. I don’t know anything about his previous patient or that patient’s situation but I got the feeling it wasn’t good. Then, there we were, all smiles and health – just one more week of healing, one more week of meds and one more week of staples – after that, we get to go on with our normal life. A lot of people don’t get to do that; we’re the lucky ones. At the same time that I want to bust open some champagne and do a dance in the kitchen I get overwhelming senses of guilt and grief for everyone who never gets to celebrate again… never gets to walk again, never gets to laugh again, never gets to live again. I don’t want to end this post on a bummer note so instead I’ll just include a reminder to hug your loved ones, kiss your spouse and spend a little more time running through grassy fields. It may be a total cliché but that’s the thing about clichés, there’s always truth to them. If you’re reading this on your computer, get off this page and email someone you love. If you’re reading this on your smart phone, go to your contacts and call your mother. Or, even better yet, get off whatever technology you’re using and go hug someone. I’ll lead by example. I just ran downstairs and planted one on Andy. After that, I hugged Chaos who can be seen in the background of this picture. Blurry picture and all, this one’s a keeper. Sitting here, crying for joy at such happy news for you guys. (No, really. There are tears.) I am so grateful your ending is a happy one. And I agree about cliches. this is wonderful…and a terrific post too!! Been thinking about you guys through this and very happy to read that all is well. Warm regards. 🙂 So happy for this!